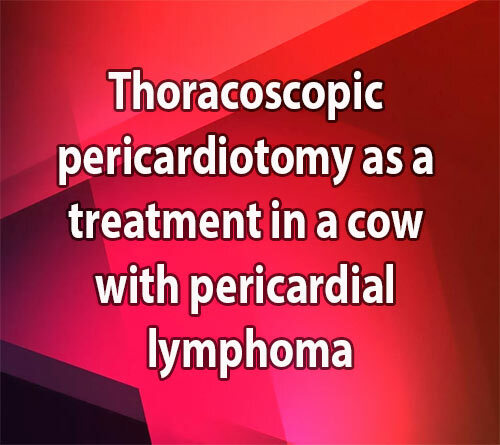 Van Biervliet J1, Kraus M, Woodie B, Divers TJ, Gelzer A, Ainsworth D. Thoracoscopic pericardiotomy as a palliative treatment in a cow with pericardial lymphoma // J Vet Cardiol. 2006 May;8(1):69-73. A 5-year-old Holstein cow, pregnant with a valuable calf, was presented with signs of heart failure (tachycardia, peripheral edema, and distended jugular veins) related to pericardial lymphoma and associated cardiac tamponade. In addition, pleural effusion was present in both hemithoraces. Medical treatment, which consisted of repeated pericardiocenteses, placement of indwelling pleural catheters, administration of intravenous fluid therapy, antibiotics and anti-inflammatory drugs, was ineffective in controlling recurrence of clinical signs despite a temporary improvement. A standing thoracoscopic pericardiotomy was performed in an attempt to reduce clinical signs of heart failure and to prolong life. Clinical signs of heart failure abated and no recurrence was seen. Standing thoracoscopic pericardiotomy along with possible corticosteroids can be recommended as palliative treatment in an effort to extend life for reproductive performance in genetically valuable animals. Her clinical signs included tachycardia (120 beats per minute (bpm), normal: 60—80 bpm), jugular vein distention, submandibular and brisket edema and intermittent mild diarrhea, suggestive of conges¬tive right heart failure. Other abnormal findings on physical examination included the presence of a fever (102.3 °F or 39.1 °C, normal: 100.4—102 °F or 38—39 °C), muffled heart sounds on auscultation on both hemithoraces, weak peripheral pulses, and decreased rumen contractions (1/min, normal: 2—3/min). Lung sounds could not be auscultated in the ventral lung fields on either side of the thorax. Palpable lymph nodes were within normal limits. An area of gas resonance was auscultated overlying the 10th intercostal space on the left, consistent with displacement of the abomasum. Echocardiographic examination revealed extensive pericardial effusion with cardiac tamponade and associated diastolic collapse of the right atrium and ventricle. The ultrasonographic appearance of the pericardial fluid was anechoic with a moderate amount of undulating fibrin tags present primarily on the epicardial surface of the heart at the right atrioventricular junction. The epicardium was thickened at the atrioventricular junctions on both ventricles creating a heterogeneous mass effect containing hypoechoic areas, suggestive of neoplasia. In addition, there was a large amount of anechoic pleural fluid detected bilaterally. The fluid line extended up to one-third of the height of the thorax on the right side, and up to one-fourth on the left side. No abdominal fluid was found on ultrasonography. The liver was questionably en¬larged, but edema of the intestinal wall could not be noticeably appreciated. Results of the labora¬tory examinations did not reveal any significant abnormality except a mild elevation in the liver associated enzymes (AST = 286 U/L, normal: 53— 162 U/L; SDH = 96 U/L, normal:	10—50 U/L; ALKP = 91 U/L, normal: 23—73 U/L; and GGT = 100 U/L, normal: 11—39 U/L), consistent with pas¬sive liver congestion secondary to congestive heart failure. Radiographs of the reticular area were negative for any metallic object perforating the reticulum. In order to obtain a diagnostic pericar¬dial fluid sample, as well as to relieve the cow of cardiac tamponade, a standing pericardiocentesis was performed under echocardiographic guidance. The left sixth intercostal space, slightly dorsal to the level of the elbow was aseptically prepared and subcutaneous local anesthesia with lidocaine 2% applied. A 10-Gauge catheterd connected to a sterile extension set was introduced percutane¬ously into the pericardial sac. Dark hemorrhagic fluid was retrieved and submitted for cytological analysis and bacterial culture. To ensure that the catheter tip was correctly placed in the pericardial space and that the fluid was pericardial and not pleural fluid, 5 mL of fluid, mixed with a small amount of air was agitated in a syringe and re-injected into the pericardial space, resulting in visible gas shadows (bubbles) in the pericardial sac on echocardiographic imaging. A total of 12 L of pericardial fluid were retrieved passively, which improved cardiac filling and function dramatically. Cytological analysis revealed that the fluid was a neoplastic effusion (total protein 48 g/L, 28 x 109 nucleated cells/L, 972 x 109 red blood cells/L) with a large number of round cells characterized by scanty basophilic staining cytoplasm, high nuclear-to-cytoplasmic ratio and round to cleaved nuclei with densely clumped chromatin and rare mitotic figures. Cultures of the pericardial fluid failed to yield bacterial growth. Based on these findings a diagnosis of effusive lymphosarcoma localized in the pericardial sac was made. As this form has been associated with bovine leucosis virus, a serum sample was analyzed for BLV exposure using the ELISA test, which was positive. Because of the value of the calf, which had a normal fetal heart rate and motility at the time of admission, the owner opted for palliative treatment of the cow and to attempt retrieval of the calf at 8 months gestation. Medical management The cow was treated with antibiotics (procaine penicillin 9 x 106 IU IM BID), non-steroidal anti¬inflammatories (flunixin meglumine 500 mg IV BID) and polyionic intravenous fluids (Lactated Ringers solution with 20 mEq KCl/L added, at 1— 2 L/h). Indwelling pleural drains were placed on both sides of the thoracic cavity on the second day of hospital¬ization due to increased respiratory effort. From the right side 25 L and from the left side 15 L of pleural effusion were drained. Analysis of the fluid was suggestive of a modified transudate (total protein < 25 g/L on both sides, nucleated cell count 5.2 x 109 cells/L on right side, 9.9 x 109 cells/L on the left side, red blood cell count 26.8 x 109 cells/ L on the right side, 414.1 x 109 cells/L on the left side). The higher nucleated cell and red blood cell count on the left compared to the right were attrib¬uted to the pericardiocentesis performed the day before. Cultures of the pleural fluid were negative. The pleural drains were removed 24 h later when drainage had ceased. The pericardial fluid was monitored echocardiographically, and gradually returned over 5 days, along with the clinical signs of congestive heart failure. Due to the failure of medical management, a pericardiotomy was recommended as a palliative treatment to prevent recurrence of pericardial tamponade and conges¬tive heart failure. It was believed that this proce¬dure would allow direct drainage of the pericardial fluid into the pleural cavity, where it would be absorbed and where it would have less effect on cardiac function. The cow was restrained in an Ohio Bovine Trans¬porter, intranasal oxygen at 10L/h was provided continuously throughout the procedure, ECG mon¬itoring was provided and her right thoracic wall was clipped and aseptically prepared and draped. Local anesthetic (lidocaine 2%) was administered to desensitize the skin, intercostal muscle, and pleura at the portal sites. A 2-cm skin incision was made in the eighth intercostal space. A metal teat cannula was inserted into the thoracic cavity to create a pneumothorax. A 10-mm laparoscopic cannula was placed and a 30° rigid laparoscope was inserted to examine the thoracic cavity, using a 300-W xenon light source for illumination. There was a large volume of serosanguineous pleural fluid present. Following the removal of 11 L of pleural fluid, the collapsed lungs, diaphragm, and pleural surfaces were examined. The mediastinum was fluid filled and turgid. Instrument portals were created at the fifth and sixth intercostal spaces. Using a grasping forceps and a hook scissor the me¬diastinum was opened and 5 L of yellow tinged fluid were drained and suctioned from the thoracic cavity (Fig. 1). The pericardium was located and 3	ml of 2% lidocaine hydrochloride were applied topically in an attempt to avoid inducing any ar¬rhythmia. A grasping forceps was used to hold the pericardium and a "T’’-shaped incision was made in the dorso-lateral aspect of the pericar¬dium using a hook scissor (Fig. 2). Approximately 4	L of fluid were drained from the pericardium. 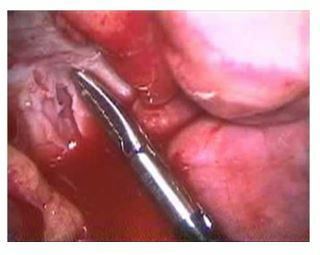 Figure 1 After making an incision into the turgid mediastinum, fluid drained spontaneously. monofilament non-absorbable suture in a simple interrupted pattern. A metal teat cannula was inserted into the thoracic cavity and suction was applied to resolve the pneumothorax. Figure 2 The position of the grasping forceps indicates where a ''T’’-incision was made in the pericardium. The pericardium was white in color and appeared more fibrous than the mediastinum or lung tissue. The pericardium retracted after completion of the "T’’-shaped incision. Fluid was suctioned from the thoracic cavity and the cannulas were removed. The portals were closed using a the cow was discharged to the care of its owner. During the next month, the cow was reported to do well, without any clinical sign of congestive heart failure. Unfortunately, the fetus was aborted 3 weeks post-discharge and the owner declined a necropsy examination. It was believed not to be caused by heart failure because no clinical signs of conges¬tive heart failure were present at the time of abortion or before. Consequently, due to the poor long-term prognosis as a productive animal, the owner opted to dispose of the cow. The previously reported technique for pericar¬diotomy in cattle is much more invasive than the procedure described in this case report. It involves a rib resection and thoracotomy either under local or general anesthesia.5,6 Thoracoscopy has already been utilized with limited success to create a peri¬cardial window in horses with septic pericardial effusion that were non-responsive to medical treatment.7,8 Thoracoscopic pericardiotomy was found to have several advantages over open peri¬cardiotomy in dogs, including less post-operative pain, fewer wound complications and more rapid return to normal function.9 These make standard pericardiotomy less desirable due to longer hospi¬tal stay, higher complication risk and possibly a higher risk for the unborn fetus. If pericardial effusion is severe, pericardiocentesis should be performed prior to pericardiotomy to improve cardiac output and prevent complications during the procedure. In breeding animals, this extended survival may allow the production of valuable offspring and may therefore represent an economically viable option. Transplacental transmission of bovine leucosis virus occurs only in a small percentage of the population and is likely not of practical impor¬tance.10 The abortion in this case is of unknown origin. Hypoxia or placental perfusion insufficiency due to the initial period of heart failure cannot be ruled out, but the abortion may have been due to unrelated causes, as the cow did not show any clinical sign of heart failure for 3 weeks between the pericardiotomy and the time of abortion. Unfortunately, the owner culled the animal after the abortion and did not permit a necropsy exam¬ination for economical reasons. At that time, the cow did not show any clinical sign of heart failure. Since clinical signs are expected to follow rapidly upon occlusion of the pericardiotomy site, we believe that the pericardiotomy was, at this time, still effectively draining the pericardial effusion. In addition, the thoracoscopically created pericardial window was intact during follow-up of 11 dogs with a mean survival time ranging from 14 to 544 days,4 and we can therefore reasonably assume that the pericardial window was still intact in this cow. Corticosteroids, especially dexamethasone, may be helpful in reducing the pericardial effusion, but in pregnant animals their abortigenic properties preclude their use.11 In a study of 48 cows,isoflupredone acetate was reported to be safe in cows at various stages of pregnancy at a dose of 30—40 mg IM once or twice daily12 and may be used as an adjunctive therapy. McGuirk SM. Treatment of cardiovascular disease in cattle. Vet Clin North Am Food Anim Pract 1991;7:729—46. Ehrhart N, Ehrhart EJ, Willis J, et al. Analysis of factors affecting survival in dogs with aortic body tumors. Vet Surg 2002;31:44—8. Maher EA, Sheperd FA, Todd TJR. Pericardial sclerosis as the primary management of malignant pericardial effusion and cardiac tamponade. J Thorac Cardiovasc Surg 1996; 112: 637—43. Jackson J, Richter KP, Launer DP. Thoracoscopic partial pericardiectomy in 13 dogs. J Vet Intern Med 1999; 13: 529—33. Ducharme NG, Fubini SL, Rebhun WC, et al. Thoracotomy in adult dairy cattle: 14 cases (1979—1991). J Am Vet Med Assoc 1992;200:86—90. Rings DM. Surgical treatment of pleuritis and pericarditis. Vet Clin North Am Food Anim Pract 1995; 11:177—82. Vachon AM, Fischer AT. Thoracoscopy in the horse: diagnos¬tic and therapeutic indication in 28 cases. Equine Vet J 1998;30:467—75. Hardy J, Robertson JT, Reed SM. Constrictive pericarditis in a mare: attempted treatment by partial pericardiectomy. Equine Vet J 1992;24:151—4. Walsh PJ, Remedios AM, Ferguson JF, et al. Thoracoscopic versus open partial pericardiectomy in dogs: comparison of postoperative pain and morbidity. Vet Surg 1999;28: 472—9. Meas S, Usui T, Ohashi K, et al. Vertical transmission of bovine leukemia virus and bovine immunodeficiency virus in dairy cattle herds. Vet Microbiol 2002;84:275—82. Plumb DC. Veterinary drug handbook. 4th ed. Iowa: Iowa State Press; 2002. p. 243. Mohammedsadegh M. Effect of isoflupredone acetate on pregnancy in cattle. Vet Rec 1994; 134:453.